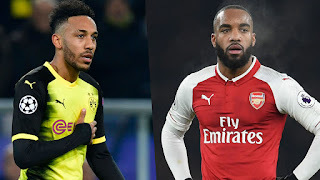 It's no more a rumour that Pierre-Emerick Aubameyang will be joining Arsenal have both clubs have agreed to a fee and the only thing stopping the move is Borussia Dortmund are trying to get a replacement. But report already has it that Chelsea Michy Batshuayi will be joining the German side on loan until the end of the season. So, With Aubameyang signing for Arsenal, we take a look at two reasons why the Gabonese striker will be a better option for Arsene Wenger when he joins the Premier League side. Yes, with Arsenal always trying to hit teams on counter attacks, Aubameyang is the best upfront for this job. His pace is tremendous and he can beat any defender when it comes to running. He might not possess the power of Lacazette but pace in Premier League is essentiate for a striker playing in Premier League and Aubameyang has got that. Aubameyang might not be the best in dribbling but the Gabonese know how to form from different angles. He is also a good penalty taker and also good with the head. Aubameyang is an all-around striker who knows how to apply his lethal finishing. His shot accuracy is also high and he also has a better positioning. On the other hand, Lacazette is also a good striker, young and still has a lot of years to develop ahead of him. We got our fingers crossed on this and we can't wait to see Arsene Wenger formation when Aubameyang joins. What do you think about our decision, do you think Lacazette is a better striker?